Standing on your feet, extend your arms from side to side, forming the shape of a cross. 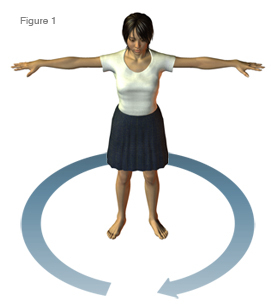 Thereafter, you begin to turn around, to spin your body from left to right clockwise (See figure 1). It is clear that the chakras will also spin with some intensity while performing this rite-exercise, and after some time of practice. Let us imagine that we are standing in the center of a large clock, thus, we spin clockwise, this is, in the same direction of the needles of the clock, until completing 12 turns; it is clear that some will begin with few turns, yet the day will arrive when you will completely perform all the twelve turns. We must whirl around with the eyes open, yet when we finish our turns, we must close our eyes in order to not fall, since we will be a little woozy according to the number of turns we are be able to perform. Thus, one day we will be able to perform the complete exercise of twelve turns. Meanwhile, you will keep your prayer, your pleading, and imploration to your Divine Mother so that She may plead and beg Her divine husband to grant us the healing of any particular sick organ. You must be totally identified as being one with the Logos while intensely asking the Divine Mother for Her intervention on behalf of you before the Logos. We have to spin clockwise from left to right. Therefore, the system allows the development of the chakras and the healing of illnesses. All of the following rite-exercises complement each other. We must start performing the exercise in a practical manner while concentrated on our Divine Mother Kundalini; our feet must be together in military style, firm, arms extended from side to side. Open Sesame! Open Sesame! Open Sesame! The former mantra appears in the book "One Thousand and One Nights." People think that such a book contains, only very beautiful tales, thus, they do not pay attention to that mantra, nevertheless, "Open Sesame" is an authentic mantra. So, command the organ to open so that the healing vital energy will enter into you through it, thus, this is how the force of the Holy Spirit penetrates into the sick organ. It is clear that the organ becomes healed with the force of the Third Logos. Notwithstanding, we must execute all of this with much faith, much faith, and much faith. Now, after your spinning exercise has finished, you open your eyes. Lie down on the floor on your back, in other words, facing upwards, legs stretched out with your heels together, your arms also stretched but horizontally, extended from side to side so that you make the form of the cross with your body, looking upwards towards the ceiling of the house. Here, you intensify your concentration; you intensify your meditation on the Divine Mother Kundalini, begging Her, imploring Her, to cure the sick organ that you want to heal. Likewise, at that moment, those who are not asking for healing can ask for any other necessity, such as the elimination of any "I," any psychological defect or the development of any psychic power, etc. Thus, while lying down on your back on the floor, we supplicate and intensify our prayer, our petition, completely identifying ourselves as being one with the Third Logos. Therefore, the position #2 is to lie on the floor in the shape of a cross. 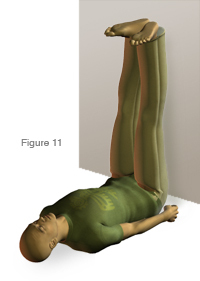 We now know how to supplicate and ask in this position (See figure 2). 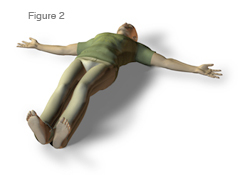 You have made your petitions while lying down in the shape of the cross; now raise your legs perpendicularly until they are in a vertical position (See figure 3). Here, it is no longer necessary to keep your arms extended and forming the horizontal line of the cross. So, move them so that with your hands you help to sustain your legs by holding them at the back of your knees, making sure that your legs are as vertical as possible without raising your buttocks from the floor. This is what in the East is called the Viparita Karani Mudra. In this position, all the blood flows towards the head. It is precipitated towards the cranium so that determined areas of the brain can be set to work, likewise in order to fortify the senses, to fortify our eyesight. We must remain in this posture for some time, while intensifying our petition to our Divine Mother Kundalini, begging her, beseeching her to help us to attain, the benefit, the healing, the faculty, the disintegration of any defect, etc., that we need. Well, after some time with this posture, after having supplicated to the Divine Mother to bring you the Third Logos and after having totally identified yourself as being one with Him so that He may heal you or may awaken a particular faculty, etc., you finish the exercise. Again, these rites are not merely physical aerobics, but six methods of prayer. It is a distinct system of healing and rejuvenation through prayer. Naturally, with much patience, slowly, we have to become accustomed to these exercises, thus the day will arrive when we will perform them easily. These are not meant to be done all at once, no! ; we must condition our organism slowly, little by little, in order to perform these exercises until they are performed correctly. Shut your left nostril by placing the index finger of your right hand on it, then inhale air through the right nostril; after the inhalation, close both nostrils with the index finger and the thumb; hold your breath for a few seconds, then uncover only your left nostril and exhale all the air through it. Now keep the right nostril shut with your thumb on it while inhaling the air through the opened left nostril, then press both nostrils again with the thumb and index finger. Repeat this exercise two more times until you complete three inhalations and three exhalations through each nostril; understand that these three inhalations and exhalations are equivalent to three complete Pranayamas. Remember to use only the index finger and the thumb exclusively from the right hand, and that is it. You close one nostril with one finger while inhaling through the opposite nostril, then you close both, and uncover the opposite nostril, etc. It is a back and forth kind of play that you perform from one nostril to the other, that is, when you close one, you uncover the other and vice versa. Once you have finished your Pranayamas, lower your head again and enter into prayer to the Divine Mother Kundalini Shakti, beseeching to your Devi Kundalini for what you need, etc. Now, while in the kneeling position, lean your body backward, making an acute angle with it while keeping the kneeling position. Your arms must be kept straight touching the body lengthwise. Lean back as far as you can and keep that position for few seconds, while begging, beseeching, imploring to the blessed Mother Kundalini, to intercede for us before the most sacred Holy Spirit so that the benefit we are requesting, whether for healing or any other purpose, can be granted to us. This exercise is performed in a considerably short time because it is strong or difficult to execute, yet it is very good in order to make the body more agile and to burn some toxins. What is important is to perform it as best we can. (See figure 5). Remember very well that in each exercise, it is necessary to beg, to intensely beseech, to even cry if necessary, in order for our Divine Mother to call upon the Third Logos in order to heal any given sick organ for us. 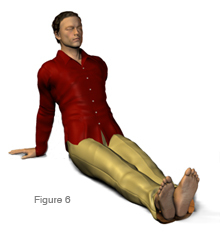 Sit on the floor, place your hands back and palms flat on the floor and stretch your legs so that the trunk of your body that is leaned back somewhat, is resting on your hands, your heels together, yet the tip of your feet opened like a fan, and your head-eyes looking forward (See figure 6). Here, we once again make our petition, our supplication, with much faith and devotion to our Divine Mother. Now, in order to execute the following exercise, let us bend our legs a little until the soles of our feet are placed on the floor. Then we must elevate our buttocks and our belly or abdomen, so that our body is in the position of a table; our knees, abdomen and face must form one straight, horizontal line. Our face must remain looking up towards the ceiling. 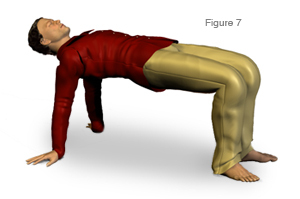 The body must be supported by the hands and the feet, thus forming, as I already stated, a human table (see figure 7). While in this position, we must intensify our imploration and supplication to our blessed Mother Devi Kundalini, asking her to invoke divine and most sacred Holy Spirit, so that he can come and execute the cure we need. 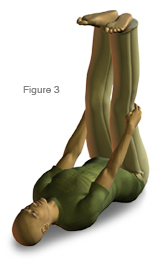 Before studying the rite-exercise called Mayurasana, let us now repeat the pranayama (figure 4). So, it is necessary to perform again three Pranayamas. These are already explained in figure 4. Then, after having performed the three Pranayamas, we place our body in the position of a lizard; this is why Mayurasana is also called the posture of the Lizard (See figure 8). Many people used to practice the Lizard posture, precisely in order to eliminate their bulging abdomen. First Position: hold the body like a Lizard as follows: hold your body up with straight arms by placing the palms of your hands on the floor; stretch your legs back and straight, and sustain the rest of your body on your feet, your tiptoes, with your face looking forward. The back, neck, buttocks, legs, and heels must maintain a straight line, just like a Lizard. (See figure 8). Second Position: while keeping your arms and legs straight, lower your head, tuck it to your chest as much as you can, and lower the knees, legs and abdomen. Repeat this movement: down, up, down, up, etc. (See figure 9). Here, we implore to our Divine Mother to activate all of our chakras. From the ninth position of the Lizard, where we have our head well tucked under our chest, without moving our hands and keeping our arms in a straight position and keeping our head well tucked underneath our chest as much as we can, with straight legs, we advance few short steps forward, until our body becomes a human arc. (See figure 10). Resting on our hands and feet and with the head well tucked underneath our chest, forming a perfect human arc, we must enter into prayer, asking, begging, beseeching, as I have already taught you, to our Divine Mother for what we most need; underneath your body cars and carriages can pass through, since it is forming a type of human arc. Now, after having prayed for a while in the arc position, we bend our knees a little in order to lower our body, and then lift our hands from the floor; we get up, in other words. We stand straight up on our feet, thus finishing with the exercise. Remember that with this position of the human arc, just as we have shown it, we make the blood to rush towards the head and the lymph to cleanse and irrigate all the cranial zones. All of these are very special exercises that help to terminate with the belly. 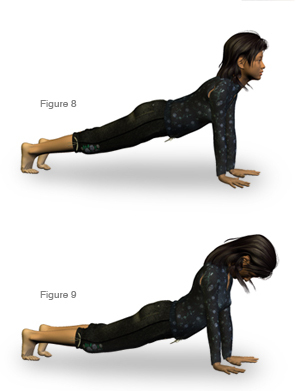 With this exercise, we say goodbye to our potbelly. This exercise is special in order to perform a great work that can only be executed by the most sacred Holy Spirit, within our organism. In our brain we have a moon that makes us the most lunar beings in this world; thus, for the reason that the moon is in our brain, our actions are negative and lunar. On the other hand, we have a marvelous sun in the umbilical region (solar plexus). Thus, from the time we exited paradise, the luminous sun that was in the brain was transferred to the umbilical region (solar plexus) and the cold moon went up to the brain. Therefore, understanding that we have this alteration in our organism, while we lie down in that position, we beg to the most sacred Holy Spirit to execute a transplantation within us: that is, to transfer the moon from our brain and to settle it in our umbilical region, and to simultaneously transfer the luminous sun from our umbilical region (solar plexus) and to settle it in our brain. It is clear that it is essential to practice the Viparita Karani Mudra incessantly, constantly, permanently, just as we are showing it, and to beg, plead, beseech the Holy Spirit to grant us the grace of making this mutation, that is, to place the moon that we have in our brain in our umbilical region and to transfer the sun that we have in our umbilical region to our brain. This is a labor that only the Third Logos can perform, and the Viparita Karani Mudra is the precise, necessary posture for it. We must profoundly implore and beseech, while concentrating on the Third Logos, so that He may come and perform the transplantation of the moon to the umbilical region and the sun to the brain. This Viparita Karani Mudra is a truly marvelous rite in order to attain the rejuvenation of the physical body. To re-conquer everlasting youth is urgent and necessary, since the body should remain young and vigorous in any initiate who marches upon the Path of the Razor's Edge. Whosoever achieves the performance of the Viparita Karani Mudra straight for three hours will defeat death and will re-conquer everlasting youth. Nevertheless, we must begin by performing for no more than five minutes at a time, and thereafter we increase the time gradually, slowly, patiently; for instance, increase it by one minute daily. For those who aspire for the rejuvenation of their body and for the healing of all sickness, here we give them this marvelous formula: the Viparita Karani Mudra. Understood? So, in the Viparita Karani Mudra we ask the Third Logos for the rejuvenation of our physical organism or to heal us from any malady or sickness, to replace the old cells for new cells, etc. Start with five minutes and add progressively one minute every day until reaching the maximum of three hours. It is evident that in order to achieve the three hours, a long time is necessary, maybe several years of constant practice, yet those years of constant practice are equivalent to defeating death by means of the famous Viparita Karani Mudra.